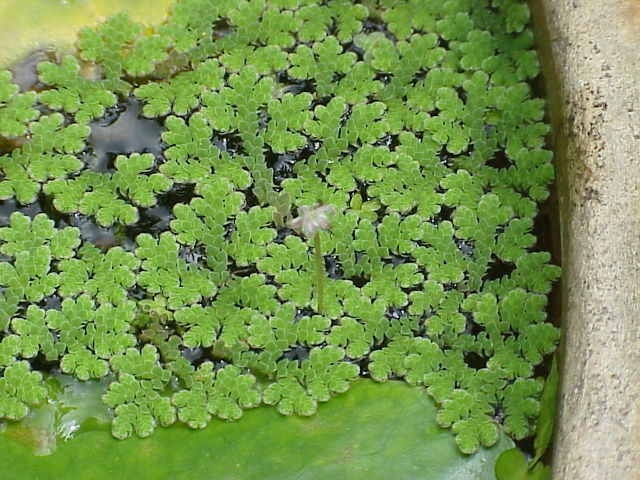 Azolla is a well known plant among environmentalists because of its ability to capture the nitrogen it needs from the air. In Asia, farmers use Azollas as natural fertilizers due to its nitrogen harboring ability. Azollas are tiny ferns clustered togegether with small dangling roots. In the summer, they can form extensive floating mats. Depending on their level of maturity, their color will vary from bright green to pink, red, or dark brown when it is fully mature. Like most floating plants, they enjoy strong sunlight and they make a great addition to any water garden. Lastly, they serve as supplemental food for pond fish. Here is a video of Azolla in a pond setting.